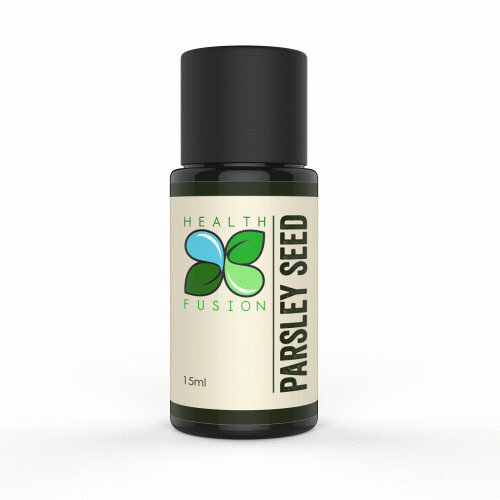 Parsley Seed - (GRAS) Health Fusion Parsley Seed (Petroselinum sativum) 100% Pure Essential oil is Organically grown in Indonesia & is a 1st distillation. Parsley Seed has a woody, spicy & slightly characteristic aroma to the parsley leaf. Many believe Parsley seed oil to be one of the most undervalued oil in aromatherapy due to its ability to aid with multiple & common complaints so effectively along with its ability to aid with detox. Parsley oil is often used as female corrective oil for woman to aid with problems associated with menstruations such as pain, cramping, nausea or menopausal issues & has been said to stimulate secretion of certain hormones like estrogen and progesterone, however, it should not be used during pregnancy. Parsley Seed along with Juniper Berry is one of the best diuretic oils available to aid with kidney, bladder, and urinary tract complaints such as the inability to properly void urine, pain when urinating, or water retention such as dropsy. Parsley Seed & can also aid with gall bladder complaints such as gallstones & aid with the removal of uric acid from the system. Generally Parsley seed is applied topically as it shows moderate toxicity due to its apiole and myisticin constituents.